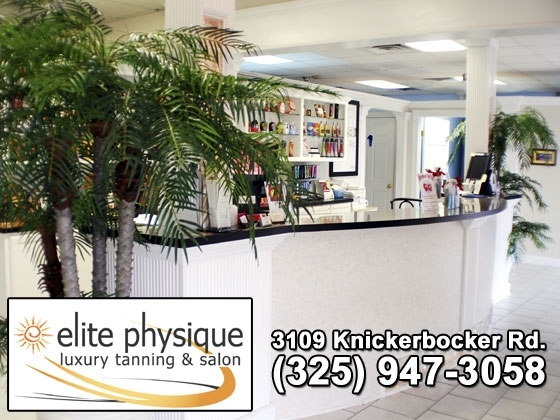 Elite Physique located at 3109 Knickerbocker Road offers 5 levels of tanning. This location has 18 beds including the Matrix, Turbo Bed, and SuperSonic Stand-Up. 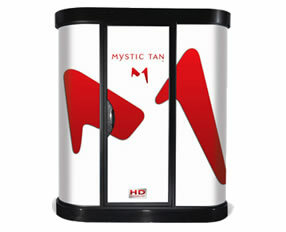 We also offer cutting edge sunless technology with the New Mystic HD and customized airbrush tanning. The best from the best! TanAmerica is proud to offer the Santa Barbara. 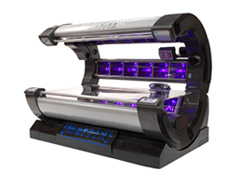 This high quality system is designed to deliver an outstanding luxury tanning experience. This bed offers a cd/radio system with speakers above your head for listening pleasure. The SunUp’s (48) 160 watt reflector lamps are staggered and recessed below the standing platform to eliminate ankle area tan lines. 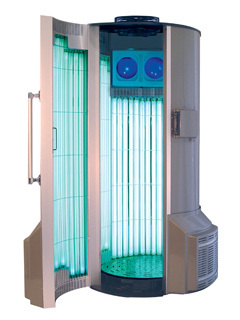 Use this unit every third or fourth session to even out skin tones and get a deeper tan. Raising the Bar! 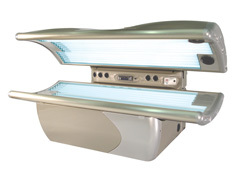 The Pacifica 12 minute tan system will meet your tanning expectations for an upgrade experience. Luxurious and uncompromising comfort, the 39 lamp Pacifica features a combination of (36)160/100 watt reflector lamps and (3)400 watt facials that will excite everyone. This bed gives you a beautiful bronze color. You will see the value in upgrading into the Pacifica time and time again. 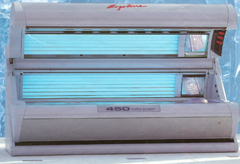 The Ergoline Classic 450 Turbo unit is a state of the art tanning bed that utilizes cross over tanning technology; it is twice as tanning efficient as other comparable units, yet quickly provides a gentle, golden tan. give tanners twice the colour that other units would, in only 12 minutes! One of our most popular beds. A 7 Minute Tan? That’s right. The SuperSonic showcases the best features from our highly successful Super Cyclone, while incorporating some state-of-the-art technology developed exclusively for our new generation of Sun Capsules. Our new 5.5 sided design adds 20% more exposure to the face and front of the body. Our new Variable Voltage Power Boost transformer adds up to 10% more power to the system. The New and Improved 220 Watt Cosmolux packs more UVA than ever before to produce the darkest tan possible from exposure times of 7 minutes or less! The new 220 Watt Cosmolux VHR/HP delivers a rich dark tan that rivals high pressure systems without all the drawbacks. The Sun Capsule SuperSonic will deliver a tan darker than anything you could imagine from a fluorescent lamp, with the shortest exposure times on the planet. Please see our Sunless Tanning page for information on this tanning option! A true 360 degree high pressure unit. 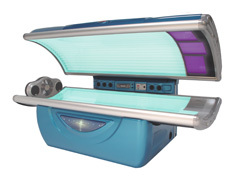 This high pressure bed produces only enough UV/B rays to produce the melanin required to tan and a lot of UV/A rays to oxidize that melanin and turn it a golden brown. This bed has more tanning power than any other bed here. Most beds require you to maintain your tan a few times a week, where this bed only required a visit once a week to maintain your tan. Copyright © 2015 | Elite Physique | All Rights Reserved.